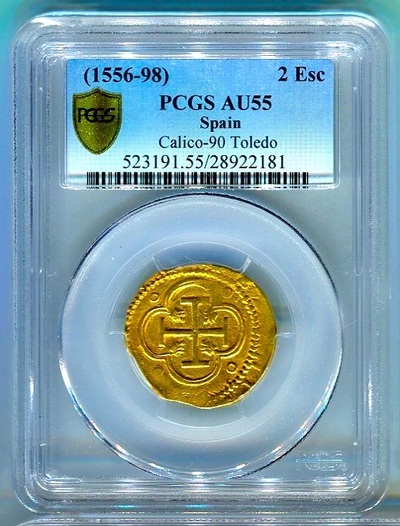 SPAIN 1556-98 2 ESCUDOS PCGS 55 "CALICO-90 GOLD DOUBLOON COIN FINEST WE KNOW OF! RARE TOLEDO MINT! 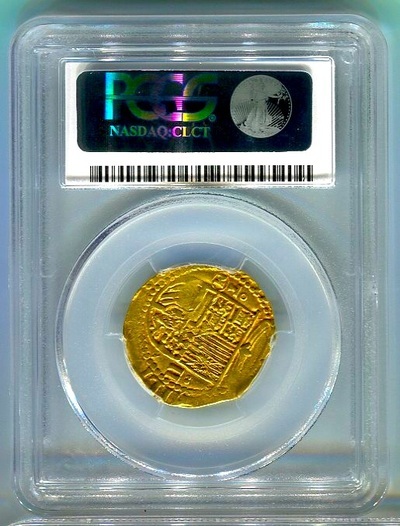 THIS GORGEOUS GOLDEN LUSTER GOLD PIECE IS STRONGLY STRUCK WITH A VERY LARGE ROUND FLAN / PLANCHET. NORMALLY NOT SEEN, THE CROSS SIDE IS VERY WELL CENTERED! A VERY HISTORICAL PIECE AT ALMOST 460 YEARS OLD! 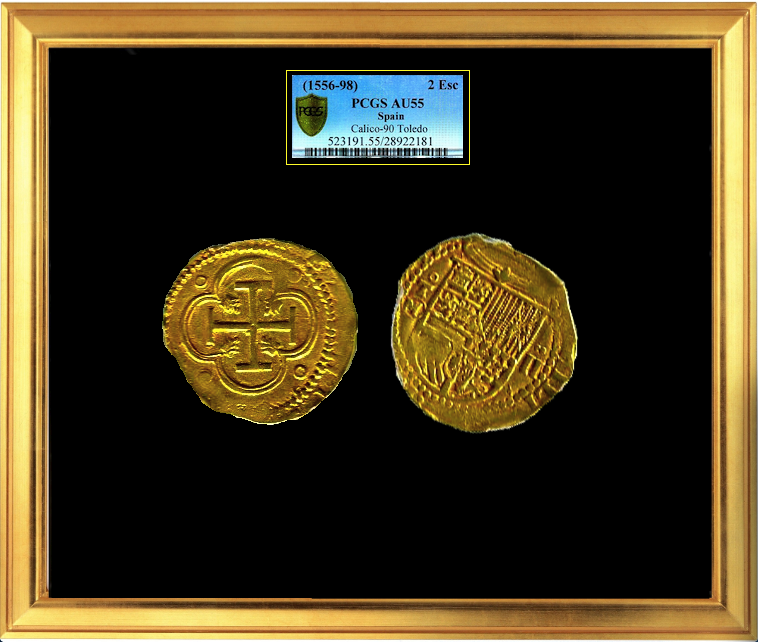 VERY RARELY DO YOU SEE A 2 ESCUDO FROM THIS TIME PERIOD, NORMALLY YOU ONLY SEE A 1 ESCUDO. IN FACT, I MUST SAY, THIS IS THE VERY FIRST TIME WE'VE HANDLED "OR EVEN SEEN" A 2 ESCUDO FOR THIS TIME PERIOD. 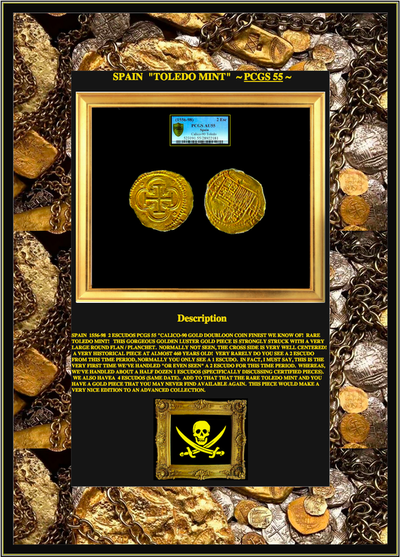 WHEREAS, WE'VE HANDLED ABOUT A HALF DOZEN 1 ESCUDOS (SPECIFICALLY DISCUSSING CERTIFIED PIECES). WE ALSO HAVEA 4 ESCUDOS (SAME DATE). ADD TO THAT THAT THE RARE TOLEDO MINT AND YOU HAVE A GOLD PIECE THAT YOU MAY NEVER FIND AVAILABLE AGAIN. THIS PIECE WOULD MAKE A VERY NICE EDITION TO AN ADVANCED COLLECTION.